No, not the WCW payperview from 1990. 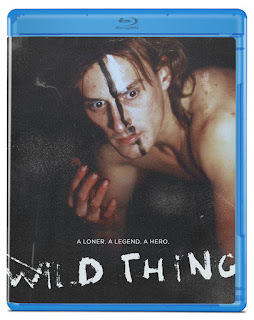 Today, I'll be reviewing the movie "Wild Thing" from our buddies at Olive Films. No Ric Flair, but I'm sure you'll still enjoy it. Starring Robert Knepper, Wild Thing provides an updated Tarzan story. As a young child seeing his parents murdered, Wild Thing quickly abandoned any form of a normal life to become a defender of the innocent in the big city as well as return to normalcy. Ok, now I know what you're going to say "Chad, I've seen this before" and most likely you have, especially with so many superheroes following that same basic premise. I'd say, this is the best Tarzan movie out there. Except it's not Tarzan. It's like a blend of Batman, Tarzan, and any Canon movie out at the time. Now, what are the high points? Well, the acting is all pretty fun. The cast is pretty good. Future star, Robert Knepper puts on a pretty good "silent savage" performance, which I'd say is the biggest highlight of this entire film. Maury Chaykin, Robert Davi, Cree Summer(Penny from Inspector Gadget and Kneesa from Ewoks!) are just some of the names you'll recognize. The cast gets a little silly and campy at times, but it was 1987 and to play a modern superhero in a dark action movie? It was expected. The action is fun, with a little hokey action cliches here and there. An inner city street gang that appears in the movie that resembles the entire Debarge band, was a fun highlight as well. Now the bad: As silly and fun as it gets, it also kinda gets slow and boring at times.At one point you stop caring for whats going on until an action scene picks up. It's also very dated. It's definitely a movie you want but need to be int he mood to watch. That's the only downside I can honestly tell you. Don't go into this thinking it's Die Hard, and you'll enjoy it. Do I suggest this movie? Yes. Chances are this is one of those movies that would've been sitting on the shelf in the video store that wouldn't have been rented but once every ten years, which is a shame because it probably should've been more successful and could've lead to a franchise, had it been handled by the right people. It's kinda sad this never got a sequel. If you're interested, I suggest you head over to Olive Films site and pick one up!